It is almost impossible to imagine what the lives of tsunami survivors is like. Not only have they lost many members of their families and all their worldly goods, but they will have to try and rebuild a life in an ongoing conflict area that is little more than a man-made disaster. It is not only time to try and rebuild Aceh's infrastructure, but also time to solve the ongoing conflict in the province. Imagine Fatimah's life. She is the wife of a local journalist. When she woke up on the morning of Dec. 26 she had a family, two children and a loving husband, a home, and dreams for all their futures. By mid-afternoon she was alone, searching for her two children and her husband. On Dec. 27, she woke up in a temporary camp for the displaced, along with thousands of others. Her only remaining hope was to find the bodies of her family. Fatimah is 40 years old. A simple Acehnese woman with simple dreams has lost everything and more. Fatimah has survived, sort of. In a refugee camp in Banda Aceh, she blames herself for being alive, "Why have I survived? Why was I spared?" But this is her fate. She has to build a new life. Over 250,000 people did not have this opportunity. They are gone, killed by the biggest natural disaster in the history of Indonesia, let alone Aceh. The tsunami has left 400,000 displaced people. It has destroyed half the Acehnese capital, swathes of Great Aceh and Calang and Meulaboh. For the surviving Acehnese, it is a different world. But even before the tsunami hit Aceh was a disaster zone, this one caused by man. When the tsunami hit in December the province was under a second period of civil emergency. Civil emergency,an extension of the preceding martial law, imposed restrictions on the locals and destroyed the life of the population. The conflict has claimed over 3,000 lives in the last two years. More people were killed in Aceh in the two years before the tsunami than over the same period in the Palestine and Israel conflict. It has destroyed huge chunks of the infrastructure. Local government says that at least 40 percent of the local population are living in poverty as a result of the conflict. If you travel on the road from Medan to Banda Aceh, the number of police and military security posts outnumber medical centers and schools. Pre-tsunami Aceh continued to resemble Indonesia under Soeharto. The military and police continue to control not only security but politics too. Aceh is the only place where the military's dual function integrating security and political responsibilities continue both in theory as well as practice. Several districts and sub districts are under military control. Indeed the current "civilian" authority is in the hands of the police. Numerous restrictions are imposed on the local population. The tsunami is just the icing on the cake. In a refugee settlement in Banda Aceh somebody joked that from Sukarno to Soeharto, and from Susilo Bambang Yudhoyono to Tsunami, all are the same: Creating chaos for the Acehnese. But there is still optimism. Locals are talking about how the horror of the tsunami can provide an opportunity to build a totally new Aceh. 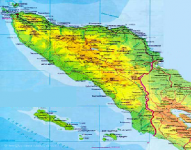 This new Aceh should be -- and can be -- different to the pre- or post-tsunami Aceh. According to Rufriadi, head of the Legal Aid Foundation in Aceh, who has himself lost everything, building this new Aceh is not simply about infrastructure or development, but also building peace. However, this new Aceh is definitely not the one outlined in some blue prints included BAPENAS' blue print. There are no provisions for dealing with the conflict. The blueprint simply aims to return Aceh to "normal", the conflict-shattered Aceh that still existed on Dec. 25. Aceh's pre-tsunami "normality" was abnormal. And yet few of the reconstruction plans on the table even mention peace-building. Numerous foreign aid agencies are overlooking the fact that Aceh is a conflict zone. It is not just the ground zero of a monumental natural disaster, but also a thirty year conflict. The inadequacy of the planning and the blueprint are not surprising given that -- once again- the Acehnese people have not been involved in the discussions about their future. Not how, who, where or when. Once again their future is being handed down to them from above, namely Jakarta. Despite many promises by Jakarta that the locals will be consulted, it remains clear that there is no mechanism being developed for the inclusion of the Acehnese in the process of reconstruction. In fact a recent attempt by several Indonesian and Acehnese civil society groups in Central Aceh to hold a discussion forum on the reconstruction process and how to involve people was banned by the civil emergency authorities. If the Acehnese are not involved in either the direction or detail of their homeland's reconstruction, nor in the discussions for terms of peace in their homeland, they will be doubly disenfranchised . Aceh's reconstruction is a vast task. The province should be opened to anybody offering assistance. The international community must be given latitude in their work to support the Acehnese people and the reconstruction of their home. Yet this involvement is currently under threat. The government issued a deadline of March 26 for foreign workers in Aceh to leave the devastated province. Initially it was given to foreign troops only, but recent statements from the Police Task Force spokesman in Aceh indicate that this is being expanded to include certain foreign humanitarian groups as well. However the problems are not simply generated by the government. There is also a very clear lack of understanding or knowledge about Aceh within most agencies now working in the province. Staff brought in from all over the world, while experts in their thematic field, know nothing of the people or the problems they have confronted their whole lives. While most have some understanding that the province has experienced a long-term conflict there seems to be little understanding of -- let alone planning for -- an active military presence, weak civilian structures, and a terrorized population.